FOUR Fianna Fáil candidate have thrown their hat into the ring in the fight for Mark Dalton’s seat. The former county councillor has pleaded guilty to 28 charges of fraudulently taking more than €200,000 from a voluntary housing association in 2014 and he faces sentencing in the circuit court this week. He resigned from the party that year but only gave up his seat on the county council last September. The convention vote will take place on Monday next 19 November in Molly O’Looney’s in Narraghmore. Back in November 2014 a special meeting of the Frank English Fianna Fáil Cumann Athy, of which Mr Dalton was previously a member, selected Brian Dooley as a local area representative until Cllr Dalton finally resigned his seat. He is favourite to fill the seat via co-option at the November meeting of Kildare Co Council. But he will fight off competition from Vera Louise Behan, a mother of three from Maganey, who has been put forward by the Narraghmore Cumann, Castledermot nominee Emmett Kane and Castlemitchell’s Gerry Brigette. “Brian Dooley is from the same cumann as that which proposed Mark Dalton, the same cumann whose members campaigned and canvassed for Mark Dalton, resides and is involved in the same catchment area of Athy and its hinterland. He is very heavily involved in a various of organisations from local GAA to the local Lions Club,” said Michael Foley PRO of the Athy cumann. “Since taking on the position of local area representative, Brian has had the best interests of Athy, the Municipal District and the Fianna Fáil party in general at heart,” he said pointing out that Mr Dooley has held local area representative clinics in Athy and Castledermot for example. 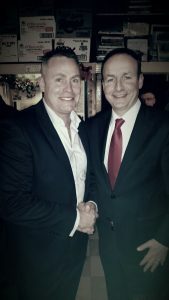 “Brian Dooley is based in the same catchment area as the former Councillor Mark Dalton and from a Fianna Fáil viewpoint, would stand the best chance of retaining this seat at next year’s local elections.To me personally, it would seem to be a no-brainer that Brian Dooley should be the candidate to win the co-option,” said Mr Foley. Ms Behan said her interest in the council seat grew out of the inspirational work of her grandparent’s generation. “I feel we owe a duty to that generation, to take care of our communities and continue to develop local resources today” she said. “I want to join the team in Kildare Co Council to help maximise the economic potential, along with the social and cultural aspects of Athy and Castledermot. Mr Brigette is keen also and knows exactly what he would like to do if he takes the position. He has four key areas of focus, jobs, the outer relief road, broadband and the development of the old vocational school in Athy. He hopes to lobby for IDA supported industry in the district, speed up slow progress regarding the outer relief road in Athy and push for a speedier roll out of rural broadband. “I would also work to see the old vocational site in Athy developed as an outreach centre for Carlow IT, the future technology university for the south east,” he said.